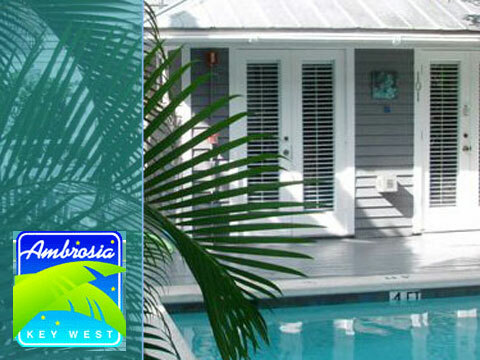 Welcome to Ambrosia Key West, a tropical bed and breakfast nestled in the heart of the Southernmost Cityâ€™s Old Town Historic District. Just minutes from the Duval Street Entertainment District, Mallory Square & the Historic Seaport, we are within walking distance to most all of the island's attractions, museums, beaches and water sport activities. We are also within walking distance to literally dozens of world-class restaurants, galleries and shops. Just ask our dedicated front desk concierge staff to help make this the vacation getaway you will never forget! Offering the ultimate in affordable, luxurious island retreats, our tropically decorated accommodations (each featuring a queen or king size bed) include spacious themed rooms, 2 room suites, 2-story town homes and a 2-bedroom, 2-bath cottage. Each of our units have private baths and entrances (most with French doors) that open up onto a variety of intimate outdoor spaces, including private verandas, pools & patios and luscious gardens with sculptures and fountains. Once inside our tropical oasis, guests of Ambrosia Key West will enjoy the bounty of sunning areas around our three refreshing pools (lap, dipping & spa.) Ambrosia Key West also offers a host of amenities, including our special island breakfast buffet, complimentary guest robes, unlimited use of our guest computer, free local phone calls, original artwork from local Florida Keys artists, refrigerators, coffee makers, cable TV, WI-FI, portable phones and message center, air conditioning, ceiling fans and our exclusive Ambrosia Key West atmosphere of tropical relaxation. Planning to get married, host a family reunion or celebrate an anniversary or special occasion? Contact our front desk concierge staff to make your stay at our island paradise a most memorable experience. Check out our specialty packages! We are Pet Friendly too... so bring the entire family!